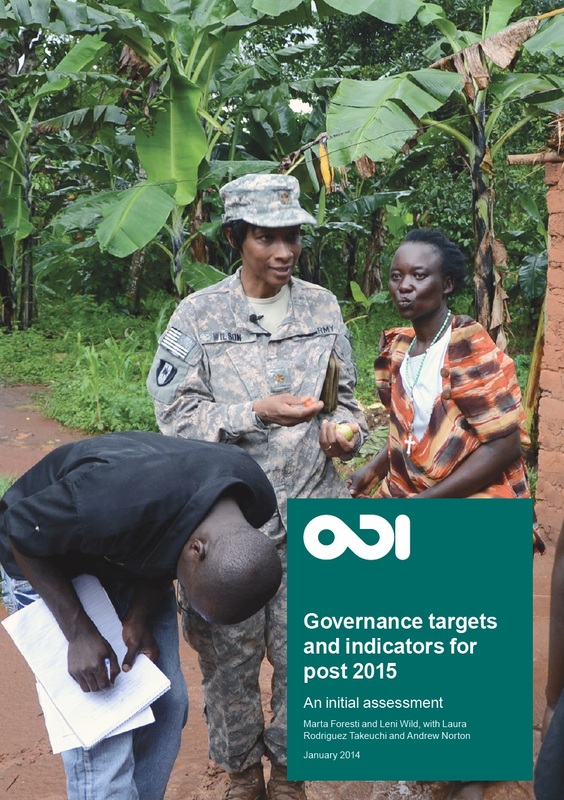 The Overseas Development Institute (ODI) published “Governance targets and indicators in post 2015: an initial assessment” in January 2014 to explore an array of potential targets and indicators to translate and measure multiple governance objectives in the post 2015 framework. The report provides emerging evidence that illustrates governance is a crucial component to the advancement of development goals, but underlines the imperative to assess the potential challenges and gaps in both data and approaches when venturing to measure the different dimensions of government. Progress has indeed been made recently in developing a range of relevant and useful indicators and measures at the national level, but the task of measuring governance globally is going to be complex and arduous. ODI emphasizes that the indicators and targets need to be carefully considered in every unique country context, and the international community must think strategically about which dimensions of governance will benefit the most from post 2015 Millennium Development Goal (MDG) style approach. ODI supports utilizing previous lessons learned from selecting and measuring the MDGs when choosing the potential indicators and targets on governance–mainly, increase assessment of reliable national level data (national accounts, surveys, and other administrative data for example). ODI argues substantial human and financial resources must be allocated to national statistical offices to guarantee their capacity to effectively collect and analyze this data. The ability to produce useful data from every country will be one of the most important challenges to consider when both establishing beneficial governance targets and indicators and attempting to compare governance progress globally in the post 2015 framework. ODI provides some of the diverse data sources available (see Table 1 in the report) to potentially assess and measure the many aspects of governance on the global, regional, country and thematic issue levels, including, for example, the Gallop World Poll, World Governance Indicators, Afrobarometer, Transparency and Corruption Index, Global Right to Information Index, etc. ODI highlights some of the gaps that arise with this wide variety of approaches to measuring governance. The strengths and weaknesses of both the subjective and objective measures, and quantitative and qualitative data of these indexes must taken into account. Also to consider is the need for more resources and capacity building to develop additional data sources in key thematic areas of governance (i.e. state capacity, freedom of expression). In addition, ODI cautions country coverage of the regional and global data sources is very inconsistent. Only a few of the indexes listed are reliable enough to contribute to the assessment of governance on global or regional levels. The indicators chosen must provide a clear direction for progress–meaning improved monitoring and evaluation would inform the appropriate action and resource allocation steps to take. It is essential for at least some (or the potential for) reliable data sources to be available when selecting indicators. The capacity of national actors to collect and produce this data must also be considered. The targets and indicators need to strike a balance between forms (i.e. compliance with international norms) and functions (i.e. providing public service delivery) of governance. What is measured must strike a balance between subjective and objective data sources. It is important to keep in mind politically sensitive issues (sovereignty, domestic politics) when selecting certain areas to monitor and improve. ODI emphasizes the imperative to choose indicators wisely, as the unique context in various countries must be individually considered. At the same time, ODI underlines not all issues deemed to be central to improving governance performance can be captured through a selection of targets and indicators, highlighting the need to reflect critically on which aspects of governance the post 2015 framework will be able to address. ODI recommends engaging with national stakeholders on the post 2015 agenda to pinpoint which national actors are willing and have the capacity to bring these future potential governance targets into fruition. But the reality remains national statistical communities and other important stakeholders have not been sufficiently consulted during the process of developing targets and indicators. It is essential to open up the discussion, which will help correlate what people want to improve on the national governance level to what is going to be measured on the global scale. Thank you and glad we spiked your interest! You can reach us through our https://localdemocracy.net/contact/ link. Thse are actually fantastic ideas in rgarding blogging. You have touched some nice points here.